Make a friend smile with a sweet thank you message. Stamp faces on white cardstock with black ink. Add coloring with pencils. Punch circles around the faces. Mat with dark brown circles. On light brown piece, stamp background with brown ink. Add a large mat with dark brown piece. Add sewing. Stamp background with Soft Blossom Ink on pink notecard. Adhere assembled stamped piece on notecard. 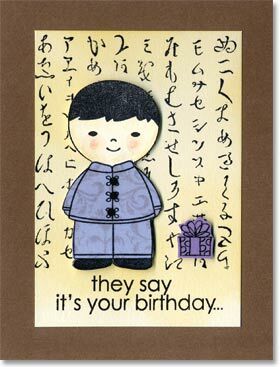 Stamp greeting with brown ink. Add gems to faces, coloring with a yellow permanent marker, if desired. If desired, add a bit to the mouths of the faces, make a bit of a smile, with a black pen. 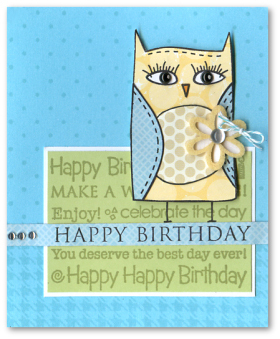 This style card can be used with any color combination! You can easily alter stamped images with a black pen. Here, I made the faces smile by adding to their mouths. Let your kids try making some of their own cards with these “kid” stamps. Stamp girl in black on white and cut out. Stamp again in pink and green. Cut out clothes portions and adhere. Stamp floral garden in pastels on white. Stamp Asian writing in black over flowers. Cut and trim and stamp words on side. Stamp flowers. Glue strip of Washi paper on bottom. Mount all onto pink and trim. Mount onto green card. Add gems. Make this little boy’s birthday card in a snap! Stamp boy in black on white cardstock. Cut out. Stamp again on wisteria and cut out clothes portion. Ink flower background in dahlia and stamp onto clothes. Adhere to boy. Stamp writing on white cardstock with black ink. Stamp words. Add chalk in a golden color. Adhere to brown card. Mount boy to cardfront. Stamp package and cut out and mount. Add cheek color with chalk. Add gems. Many stamp images make great patterns for clothing! Pair this simple garden sketch with a message of gratitude. Stamp Butterfly Garden on white cardstock in black ink. Color with colored pencils. Stamp message just below the Butterfly Garden image. Trim and round corners. Stamp flourish on the green card and on a purple strip with VersaMark. Add brads to the purple strip and assemble as shown. Keep the coloring simple by limiting the number of colors you choose. 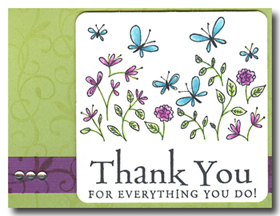 Combine fun colors with cheerful butterflies to send your note of gratitude in style. Trim a white notecard to a square shape. Stamp Butterfly Garden onto a piece of Peony cardstock with Versamark ink, top with white embossing powder and heat emboss. Adhere to white notecard. Add a strip of yellow patterned paper as shown. Stamp Butterfly Garden onto Blossom cardstock with dark pink ink, round corners, and adhere next to yellow strip. Stamp Butterfly Garden again onto Blossom cardstock with dark pink ink and cut out a single butterfly. Glue on top of white embossed butterfly on Peony layer. Zig-zag stitch on a thin strip of Lagoon cardstock and adhere across card. Add a Green Apple strip below. 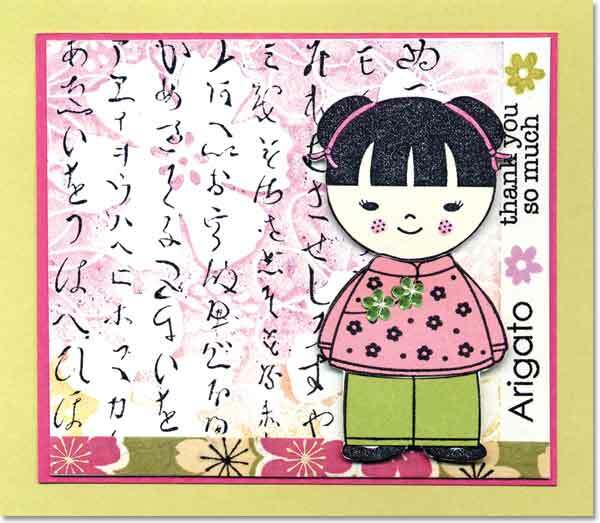 Stamp “Thank You” onto a small scrap of grid paper with dark pink ink. Adhere as shown. Finish card with a yellow art flower and button tied with floss. 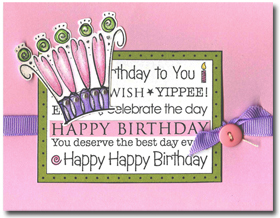 This image serves double duty as the focus of the card as well as a background image on the light pink strip. Create multiple cards for a complete wedding ensemble with Hero Arts stamps and inks. 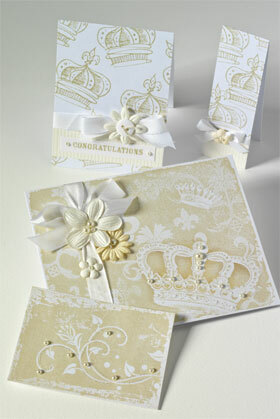 Stamp the Crown Collage image with Soft Sand ink onto a White Notecard. Shade areas of the crown with a color pencil that is a little darker than the ink color. Wrap the card with ribbon tied in a bow. Add Art Flowers and Small and Medium Accent Pearls to finish. Cut a White Notecard in half to create a mini card. Stamp the Misty Floral and Crown Pattern image with Soft Sand ink onto the mini card. Add Small Accent Pearls to finish. Stamp the Royal Crown image with Soft Sand ink randomly on the upper portion of the card. 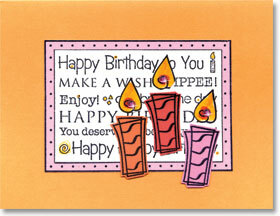 Add a strip of corrugated paper to the bottom edge of the card. Stamp the “Congratulations” message from the All Occasion Messages set with Walnut Stain Distress ink onto a strip of from a White Notecard. Affix to the card. Wrap the card with a ribbon tied in a bow. Add an Art Flower, a Card Button and Small Accent Pearls to finish. 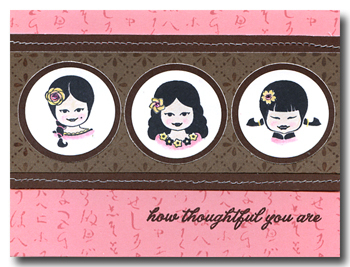 Use scraps of cardstock to create a Scrapling (1.25″ x 4.25″). Stamp the Royal Crown image with Soft Sand ink on the top portion of the Scrapling. Wrap a ribbon around and tie in a bow. Finish by adding a small Art Flower and a Small Accent Pearl. Cut cards in half and use scraps to create mini cards for wedding gift tags and response cards.